Image Drywall & Paint - The complete Alaska drywall contractor and painting contractor service. Serving the Mat-Su Valley area including Wasilla and Palmer, as well as the Eagle River and Anchorage area. Additionally, we have crews ready to travel anywhere in Alaska. We can take your new construction or remodel project all the way from delivery and stocking of the first piece of sheet rock through the hanging, taping, texturing, and on to the final paint job. With just one phone call you can have peace of mind that all of these critical building phases will be accomplished seamlessly, economically, and in a professional and courteous manner. Alaska Drywall Contractors - We are one of the leading Alaska drywall contractors and we specialize in all types of drywall ( sheetrock ) jobs. Image Drywall & Paint can handle any dry wall project from small residential projects to large muti-family apartments or commercial buildings. 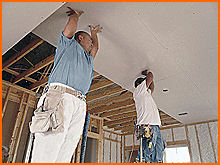 We have many drywall / sheetrock crews that can handle your drywall project quickly, efficiently and professionally. We are among the most competitive drywall contractors in Alaska. We take pride in coming in on budget and on time. No drywall or sheet rock project is too hard for our highly experienced drywall construction crews. We invite you to use our simple FREE ESTIMATE form so we can provide a bid for your next job. 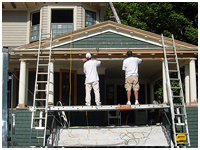 Alaska Painting Contractors - Image Drywall & Paint is also one of the leading Alaska painting contractors. We can take you all the way from interior paint, interior trim and door painting on to finished exterior painting. Our professional painting contractors are neat, efficient, and they take pride in the smallest detail to assure our customers the satisfaction they deserve. Use our simple FREE ESTIMATE form so we can send you a bid on your next paint project.